Welcome guests with decorative traditional walkway luminarias. Brighten your walkway, entryway, sidewalk or patio for a special occasion. Just add a LumaBase water filled candle holder or sand and an LED light. They add a decorative flair while lighting the way for guests.Indoor and Outdoor UseQuantity: 100Dimensions: 11 inches high x 6 inches length x 3.5 inches wide Accent Type: LanternMaterial: PaperColor: White. Welcome guests with decorative traditional walkway luminarias. They brighten up your walkway, driveway, sidewalk, staircase or patio for a special occasion. Just add a lumabase water filled candleholder or sand for weight & an LED Candle. They add a decorative flair, while lighting the way for guests. 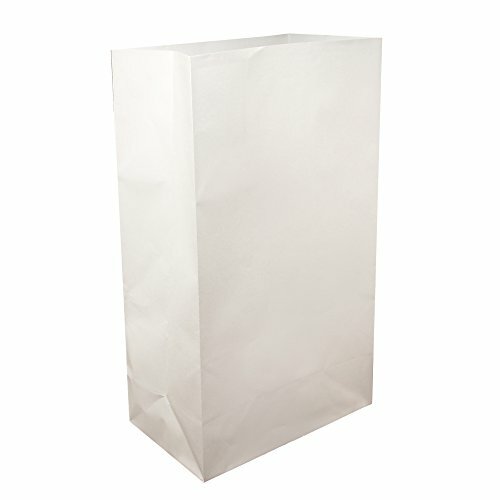 Included: 100 paper bags.